Evergreen perennial arising from a short, stout rhizome. Lanceolate, 20-150 cm long, 5-25 cm wide, 1-pinnate; pinnae oblong, all of them more or less in one plane, with spreading teeth. Moist to mesic forests in the lowland and montane zones; common in coastal BC, rare in SC and SE BC south of 54degreeN, rare northward; N to AK and S to SD, MT, ID and CA. 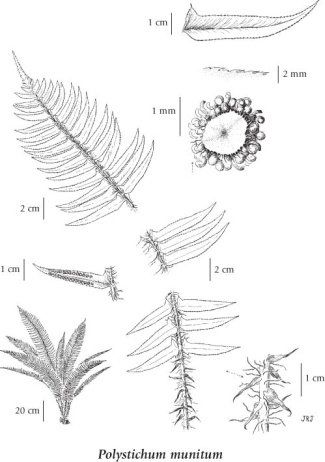 A shade-tolerant/intolerant, submontane to subalpine, Westem North American fern distributed more in the Pacific than the Cordilleran region. Occurs in cool mesothermal climates on nitrogen-rich soils; its occurrence decreases with increasing elevation and continentality. Widespread in forest understories. Persists on cutover sites, sporadic to scattered on water-shedding sites, plentiful to abundant (frequently dominant) on water­receiving and colluvial sites enriched by surface flow of fine organic materials. Commonly associated with Achlys triphylla, Mahonia nervosa, and Tiarella trifoliata. A nitrophytic species characteristic of Moder and Mull humus forms. Polystichum munitum var. incisoserratum (D.C. Eaton) Underw.